"The group's performance at Western Michigan University's Dalton Center Recital Hall Wednesday night was a combination of clear themes for those people who like their jazz light, and complex rhythms and tonal colors for those people who want something more abstract... Tri-Fi has come up with a jazz sound everybody can root for. " KALAMAZOO — The name of the jazz group Tri-Fi may not make much sense, but the group’s music surely does. The group’s performance at Western Michigan University’s Dalton Center Recital Hall Wednesday night was a combination of clear themes for those people who like their jazz light, and complex rhythms and tonal colors for those people who want something more abstract. Like Vince Guaraldi and his music for “A Charlie Brown Christmas” in the ’60s and later Pat Metheny, Tri-Fi has come up with a jazz sound everybody can root for. 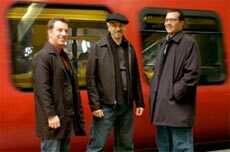 The group, in the midst of a tour to promote its newest CD release, “Postcards,” will remain in Kalamazoo today to offer master classes at WMU and a jam session for area jazz students at 8 p.m. at The Union Cabaret and Grille, 125 S. Kalamazoo Mall. Those 100 people who braved single-digit temperatures for Tri-Fi’s Wednesday night show were treated to a 75-minute set of eight originals and one standard. The standard, “I Didn’t Know What Time It Was,” went down easy like a glass of lush, aged Burgundy wine: complex, a touch of pepper and layers of sensuality. The group maintained that tone throughout the set with energy, precision and style. Most numbers were taken from “Postcards” and the group’s 2005 CD, “Tri-Fi.” The original “Good Night Charlie Brown,” a tribute to Charles Schulz, was most effective. The group, a back-up band for jazz singer Curtis Stigers, had strong balance — each member was equally matched — and so, in the end, each member received lots of solo playing time. That was most noticeable when fine bassist Phil Palombi got numerous solos, unusual for any jazz set other than those in which the bassist is the leader. Those solos were some of the best moments of the show as Palombi’s tones slid and dropped while pianist Matthew Fries filled in spaces with elegant chords and local drummer Keith Hall added atmosphere with delicate cymbal splashes. The group invited WMU senior Terrence Massey on stage for the performance of the group’s original “Wisdom…1st Things 1st.” Massey, who was given an award for best collegiate soloist in the Detroit Jazz Festival last September, made the most of the appearance, offering searing tones and rhythmic riffs in several solo breaks.